Week 122 and the usual dip into Mary Berry‘s Baking Bible is getting a little restrictive because I am on the “home straight” and have so many recipes already under my belt! 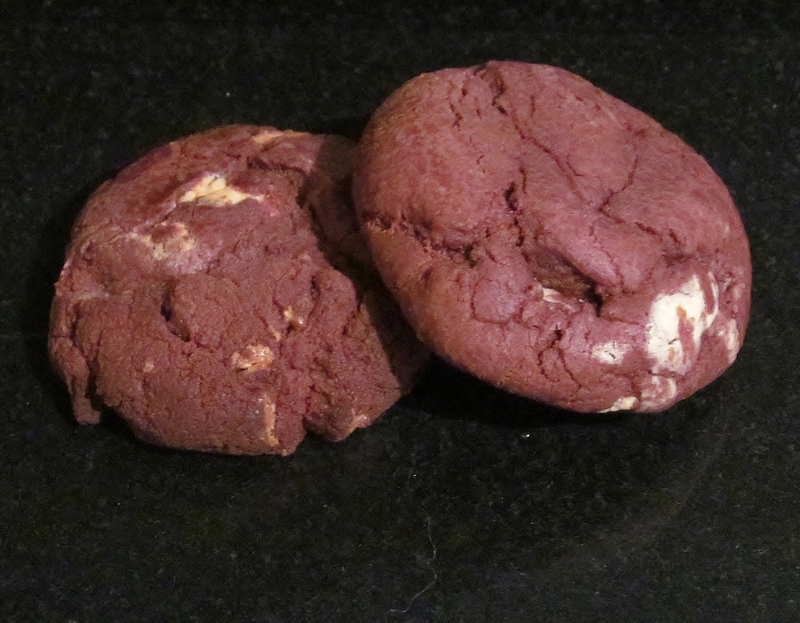 After the glutony of the chocolate fest cakes, I chose two of the biscuit recipes that I had yet to do. I started with the lavender biscuits. 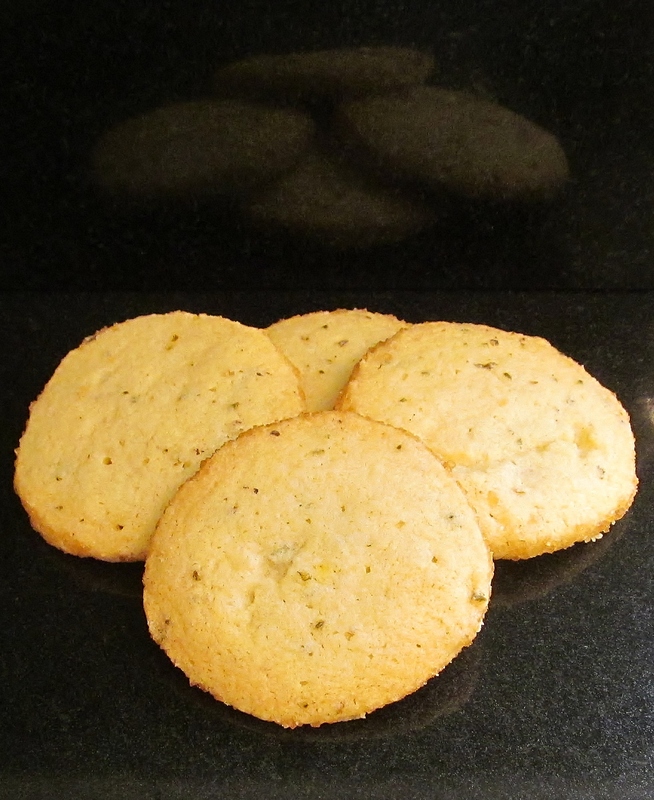 I had fancied doing these biscuits for a while but wanted to use fresh lavender. I had brought a small plant several weeks ago but it had not done much so one of my chief tasters kindly went and brought two plants with flowers just emerging so I could make these biscuits and I have some extra plants for the garden to boot! 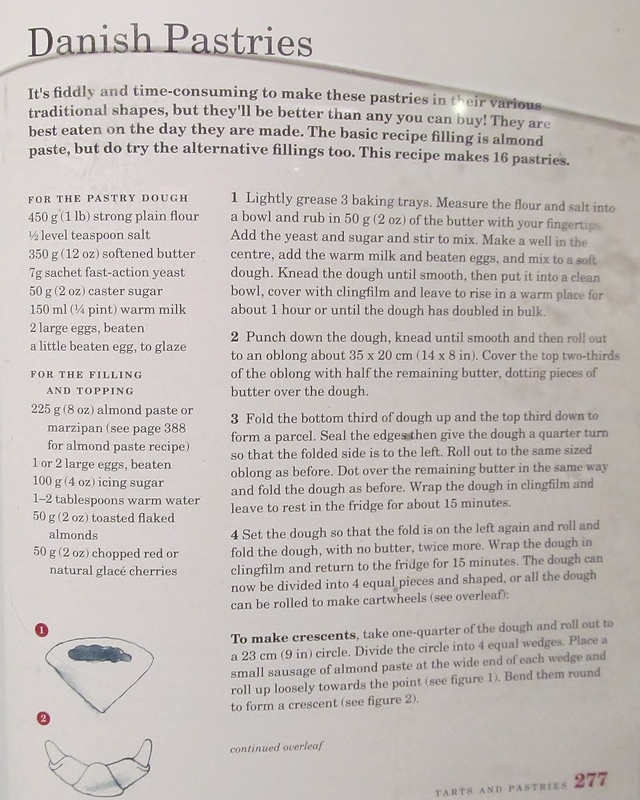 I followed Mary’s instructions carefully and mixed the butter and the lavender together and then added the other ingredients to form a smooth dough – this wasn’t as easy as it sounds! Mary then asks you to divide the dough in to two halves, roll them out to form 2 sausage shapes, roll these in the sugar, wrap in baking parchment and chill until firm – this took quite a while. Once firmed, cut each roll of dough into about 10 slices and bake them. After about 15-20 minutes, the biscuits were done. They looked unusual and the lavender had a subtle aroma. They tasted lovely too but I am not sure about “eating” lavender! 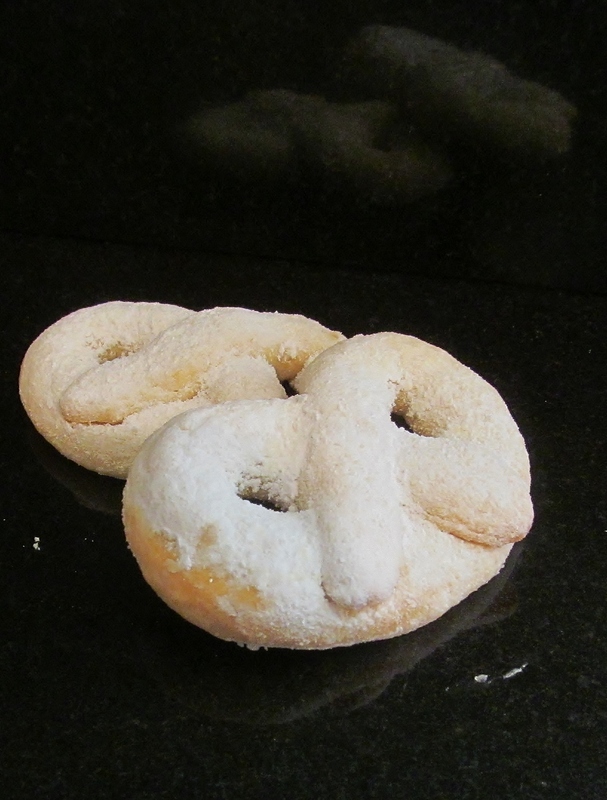 The second recipe was Mary’s Sugar Pretzels, I had no idea how these would turn out as I have lived a very sheltered life and never eaten a pretzel – sugared or otherwise. It started with Mary’s instructions to rub the butter into the sugar- never my favourite past time! Mary then asks you to stir in the sugar and the egg and vanilla extract until the pastry comes together – and miraculously it did! I kneaded it lightly, wrapped it in cling film and chilled it until firm. Mary then asks you to divide the dough into walnut sizes and roll out into a thin sausage and then twist into the “traditional ” pretzel shape- thankfully Mary had a picture to roughly guide me in the right direction. Bake for 8 minutes – or as Mary says until they barely change colour and then lift onto a cooling rack and dust thickly with icing sugar. I followed Mary’s instructions to the letter and I think they turned out okay, I thought they were a fairly bland biscuit and probably would not bake them again. I dutifully divied the biscuits up so we had some and the chief tasters had a plate…unfortunately hubby said that the biscuits “just slid” off the plate, onto the patio when he went to deliver them and so they had quite a few less this week than they should have done- oh well, they do say my baking is expanding their waistlines so a few less won’t harm them! 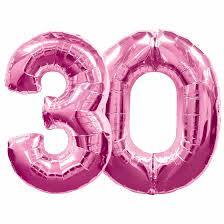 The countdown continues and I have now reached the landmark number……. 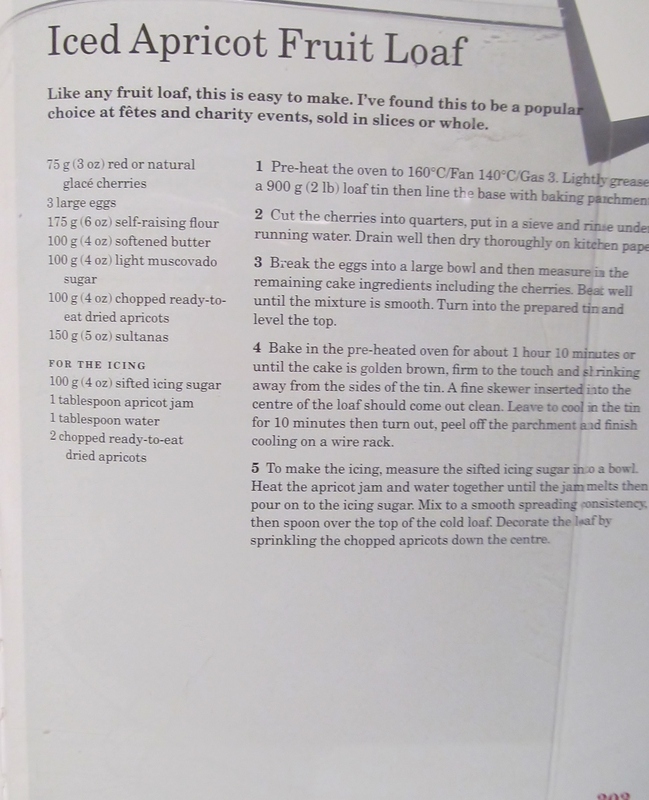 Week fifty nine and I am beginning to wonder where the time goes in between the bakes…it just seems to gallop along! I had quite a sweet tooth craving this week and decided upon Mary Berry‘s iced apricot fruit loaf first. Mary’s recipe from her Baking Bible is the usual “add everything to a bowl and mix” which is really easy when you have so much else to fit in at the weekend. 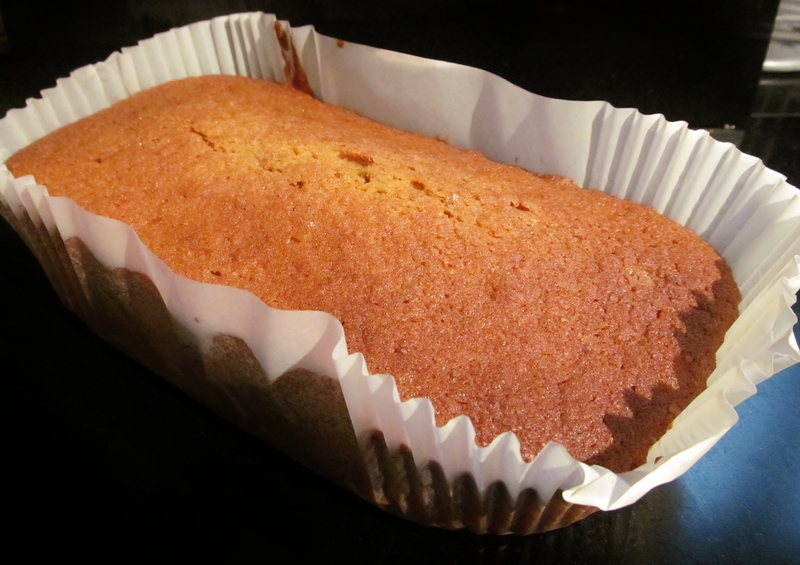 I mixed it and poured it into a loaf tin and put it in the pre heated oven for an hour and ten minutes. I began to get the lovely baking aromas in the kitchen about half way through it baking and it began to make my tummy rumble. Soon enough, the timer pinged sounded and I got my trusty skewer to check it was done- yep, all done, Mary recommends you leave it to cool in the tin for about 10 minutes before tipping it onto a cooling rack. It seemed to take forever to cool and be ready for the icing topping. Mary asks you to combine some water and apricot jam, heat both together to combine and then add icing sugar. It makes a tangy apricot icing. Mary then recommends finely cutting two apricots and sprinkling them down the middle. I decided to slice mine so it had more of a Mohican look! 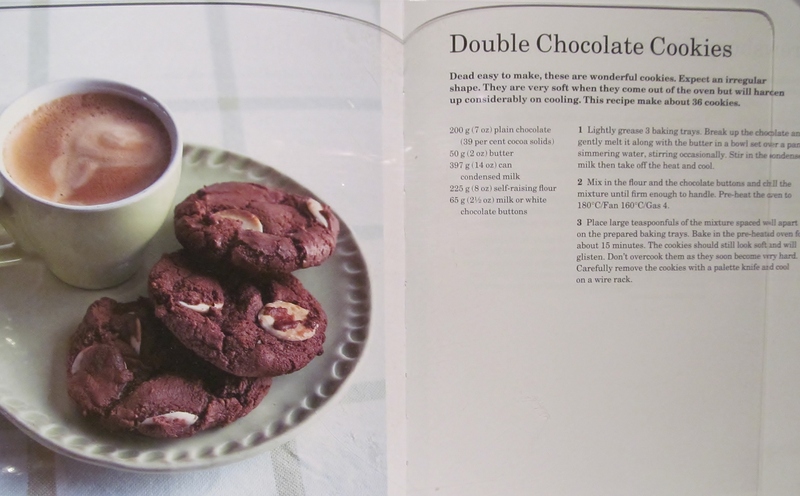 Mary’s second recipe was double chocolate cookies. 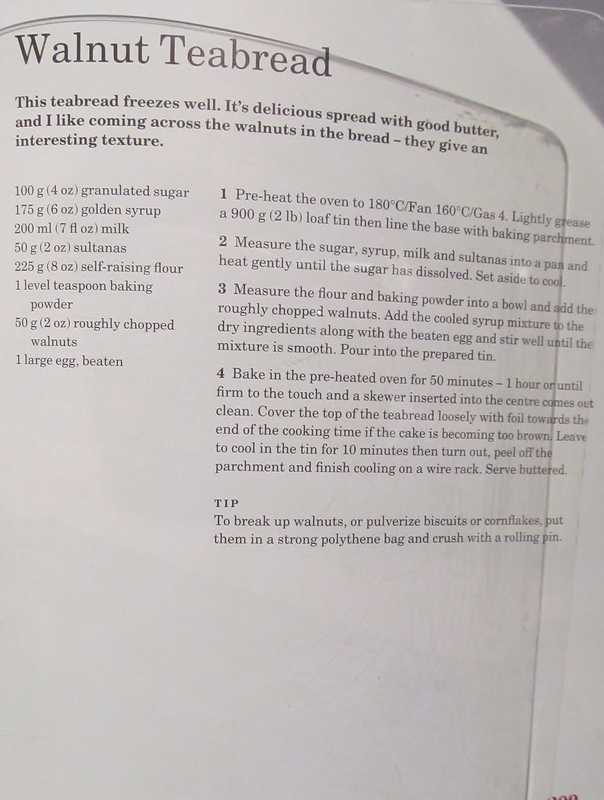 This involved melting some dark chocolate with some butter then adding a tin of condensed milk– I could see this was going to be a usual slim line Mary recipe! Once the chocolate had melted and the condensed milk added, you needed to leave the mix to cool then add to the dry ingredients. This then had to be chilled until it was easy to handle. Mary asks you to grease some baking trays and add teaspoons of the mixture in regular intervals, leaving space for expansion. The cookies only take about 10-15 minutes to bake, they are quick and easy to make and seemed to go down well with hubby which is always a bonus! Well I have been having withdrawal symptoms from The Great British Bake Off finishing but I am bolstered this week by the 50th Anniversary episode of Dr Who – I am a true Whovian! 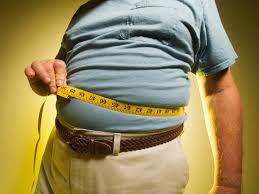 I am also looking forward to watching the antics of the celebrities in I’m a Celebrity……. Week fifty five and I now can’t imagine a weekend without getting out Mary Berry‘s Baking Bible to look and see what I haven’t yet done and what I want to do this weekend with whatever time I have. 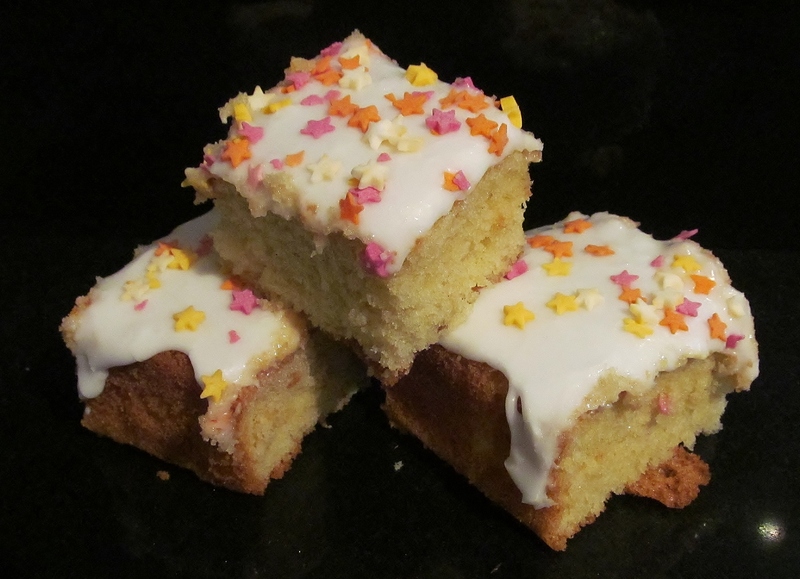 This week, I chose the basic tray bake that begins the tray bake section. I love the simple instructions that Mary gives you- pretty much throw all the ingredients in a bowl and mix thoroughly together. 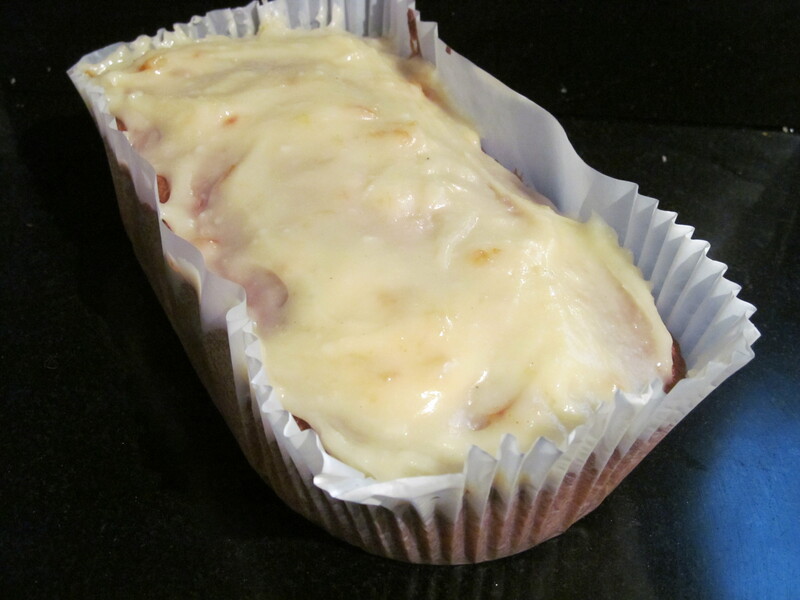 I used one of my foil tray bake tins from my favourite shop- you guessed it….Lakeland! I poured the mixture in, spread it as evenly as I could and put it in the oven. My how time flies when you are having fun and I used the time to get out all the bits and pieces I needed for the next recipe. Finally the timer pinged and I checked the sponge. I was evenly cooked and I was happy with it. 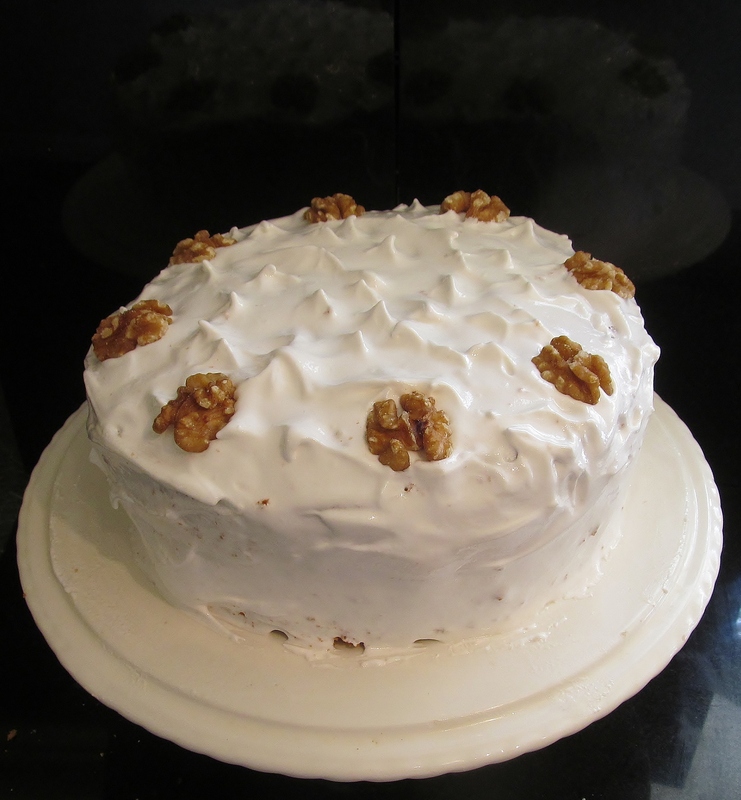 The only “Kim ” addition was to add some basic icing to the top with some sprinkles instead of Mary’s suggested dusting of icing sugar– it brought out the inner child in me and reminded me of baking with my mum and nan. 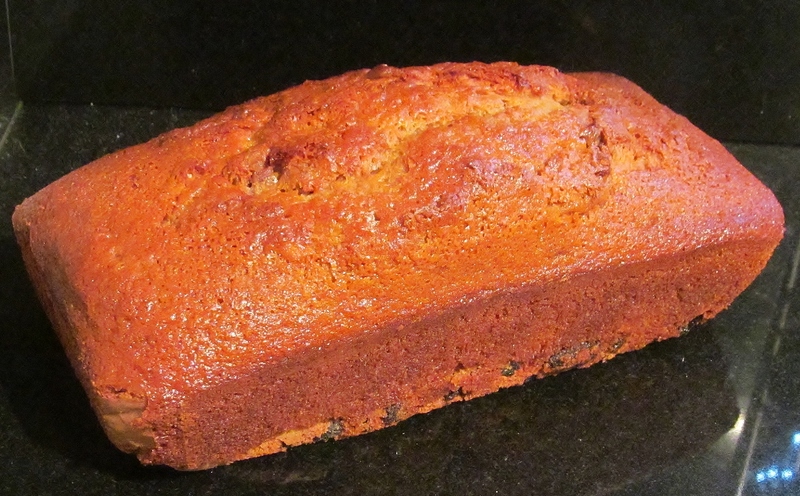 The second recipe was Mary’s walnut tea loaf. This recipe starts in a pan on the stove by heating the sugar, golden syrup, milk and sultanas. Once the sugar has dissolved, you need to allow the mix to cool. Meanwhile Mary asks you to add the dry ingredients into a bowl and then add the cooled mix with a beaten egg until the mix is smooth and pour it into a bread tin. Not so tough! Into the oven it went and I used the time to tidy the usual mess in the kitchen where despite all efforts, flour goes everywhere but especially on the floor and on the dogs! The timer was set and I set to putting the kitchen back into some kind of order. Finally the timer pinged for the last time this weekend and I checked the tea loaf. It had a good rise and the testing skewer came out clean. I allowed it time to cool in the tin and then tipped it out to finish cooling on a rack. Mary suggests that it tastes good spread with some butter- I think it was so moist, it tasted good without anything on it! It’s The Great British Bake Off Semi Final- woo hoo. It comes to something when I delay my weekly blog in order to have some TV time with this. I enjoyed the show and was sad to see Beca go, I thought it would be a toss up between her and Ruby and by the tears and look on Ruby’s face, she thought it might have been her time. I am pleased that Ruby is in the final but also my favourite from week one -Frances. I hope she manages both style AND substance next week to give Ruby and Kimberley a run for their money! 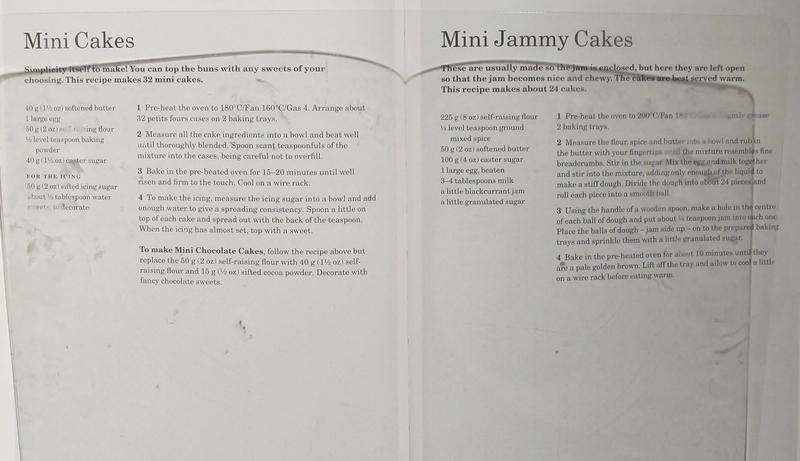 Week Fifty Four – Mary Berry’s Mini Cakes, Mini Jammy Cakes & Danish Pastries! Week fifty four and this weekend I was on top form-well as good as it gets! Looking through Mary Berry‘s Baking Bible , I still haven’t got half way yet but this week gets me a bit closer to that goal! I started with Mary’s mini cakes and mini jammy cakes in the children’s section. 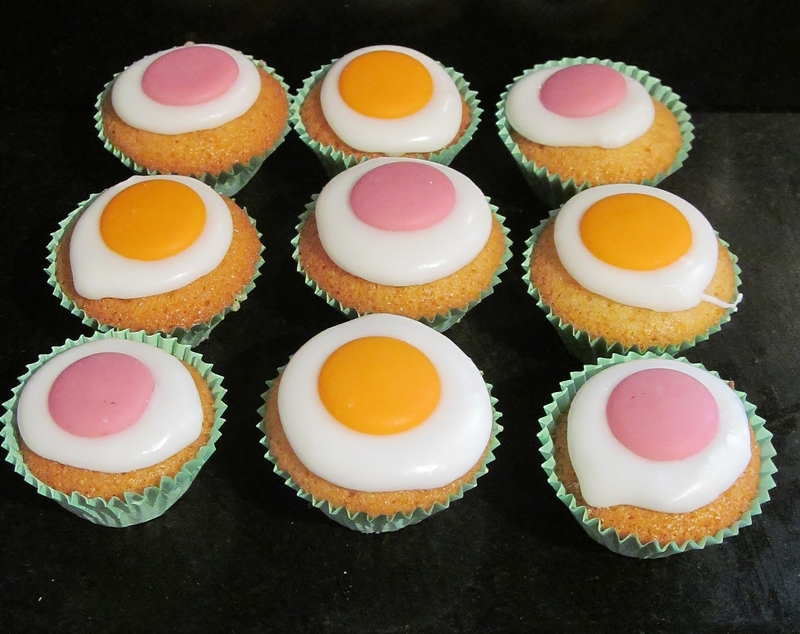 I have a mini muffin cooker gadget so used that to bake the mini cakes in batches. 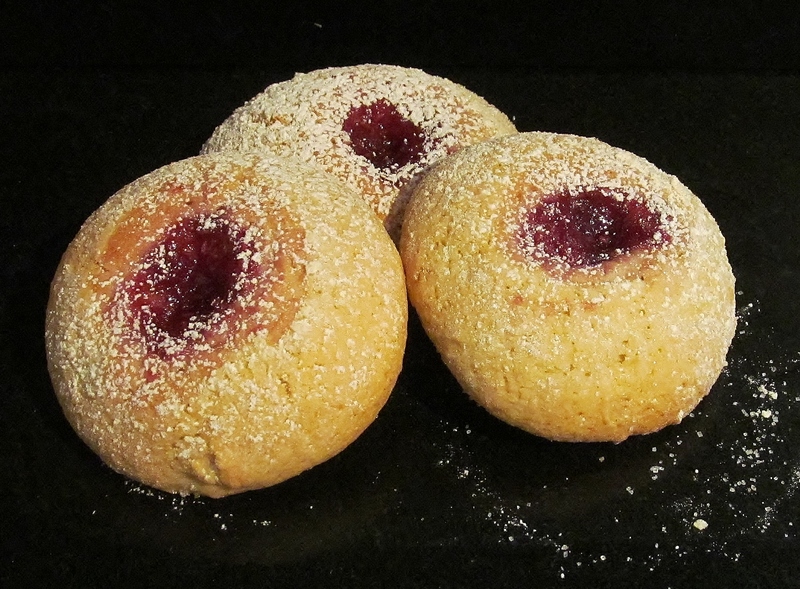 While the first batch was on, I made the mini jammy cake mix which is more of a dough and in between swapping batches in the muffin maker, I rolled out the cake dough into balls, used a wooden spoon end and made holes in them and added some jam into each one. I placed them onto the baking trays and popped those into the oven. The mini cakes were done in about three batches so I mixed the icing and found some flavoured chocolate buttons for the toppings, they look very cute. The mini jammy cakes came out looking like half doughnuts and I thought they were quite stodgy and I wasn’t overly keen on these. The final recipe of the weekend was Danish pastries, as this involved fiddly pastry making, I begin that process before the other cakes and by the time I had finished the mini cakes, the pastry was pretty much ready and I decided not to do the almond filling as I am not overly keen on that so used Mary’s alternative fillings of a vanilla cream and also used apple. I folded them carefully into the envelope parcels as Mary describes and they finally went in the oven. When they came out, the pastry had certainly risen and I left them to cool. 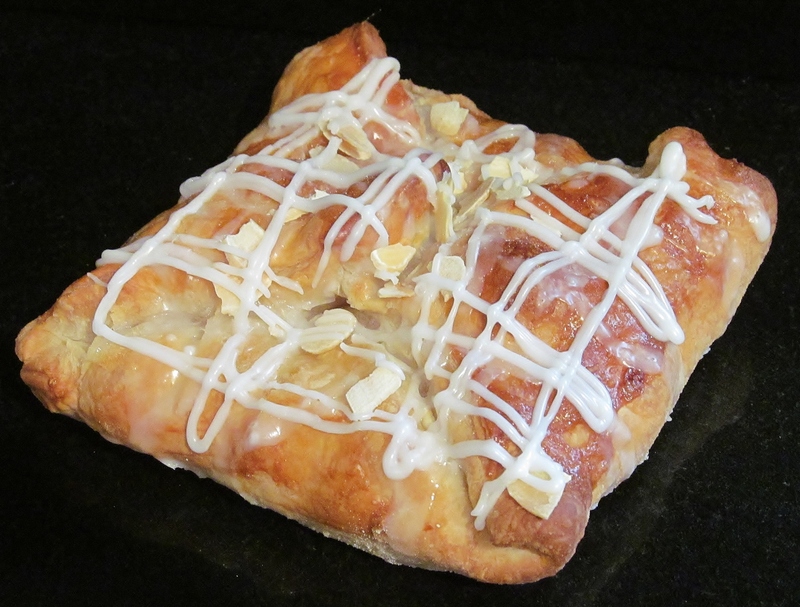 Then I mixed some icing sugar into a loose paste and drizzled it over the pastries and sprinkled some almonds over. They certainly looked lovely and tasted good but if I made them again, I would probably cheat a little and buy ready-made pastry! The Great British Bake Off is nearly done now, I can’t wait for tomorrow’s instalment tomorrow. I loved Beca’s traditional welsh spring lamb and vegetable suet pudding last week and Frances’ musical pastries. She managed to combine the taste and the creativity! What will tomorrow bring? Week thirty five and I had a good reason to make a cake this week. It was my niece‘s birthday recently and we were going down to stay with family for a few days. I sent a text to my niece to ask if she wanted a sponge and strawberry kind of cake or a chocolate kind of cake. 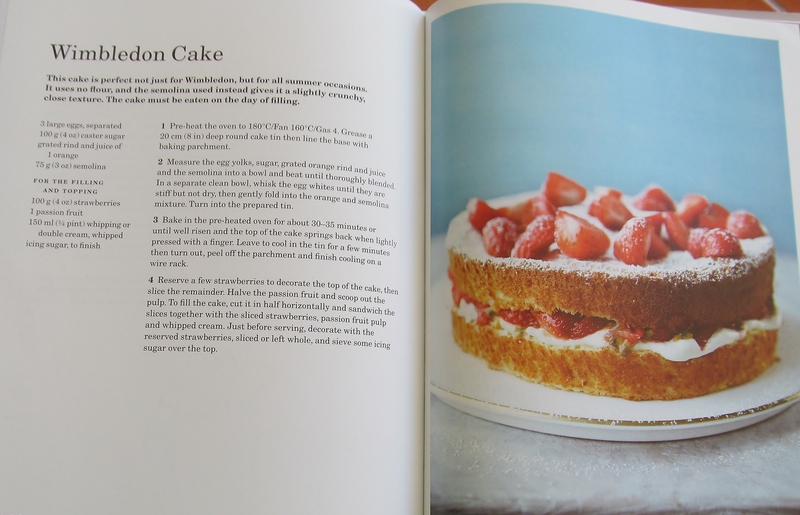 To my surprise, she chose the sponge and strawberry kind of cake and Mary Berry‘s Wimbledon Cake fitted the bill. 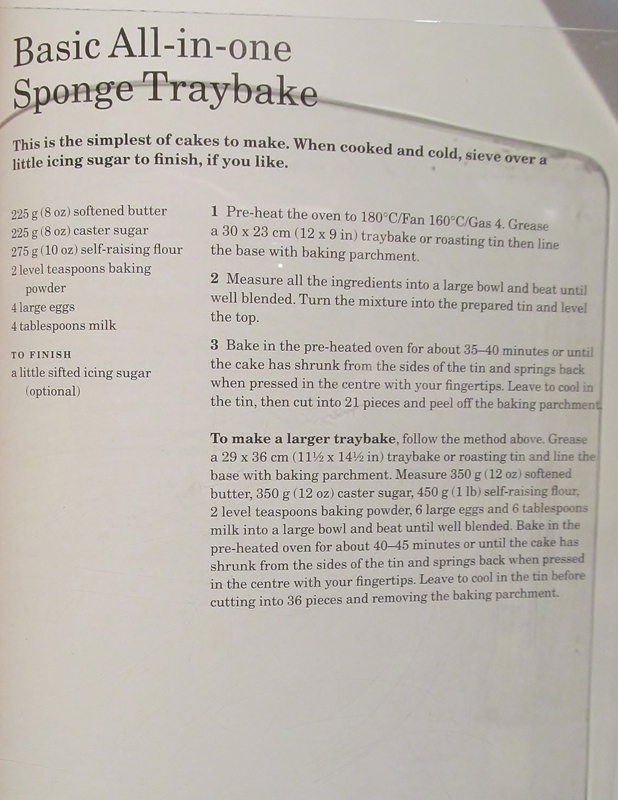 This recipe is quite different in that the sponge mix does not use butter or the usual flour but separated eggs , both used in various stages and semolina. 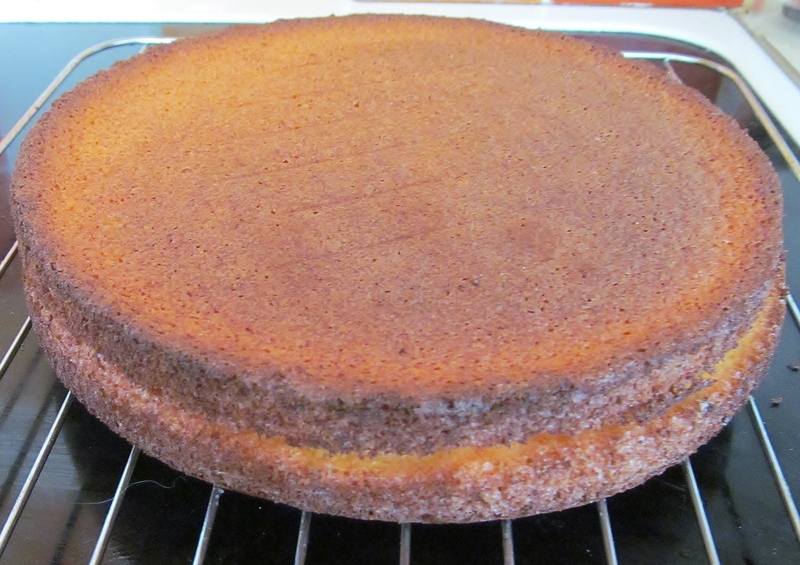 The sponge mix doesn’t rise much so the sponges look quite flat when they come out of the tin and as I used my mum’s fan assisted oven, they were a little browner than I would have liked them. Any way, I got the sponges baked and cooled and then whipped some cream. I then filled the centre with cream and chopped strawberries, I didn’t add the passion fruit as none of my family are keen on that. 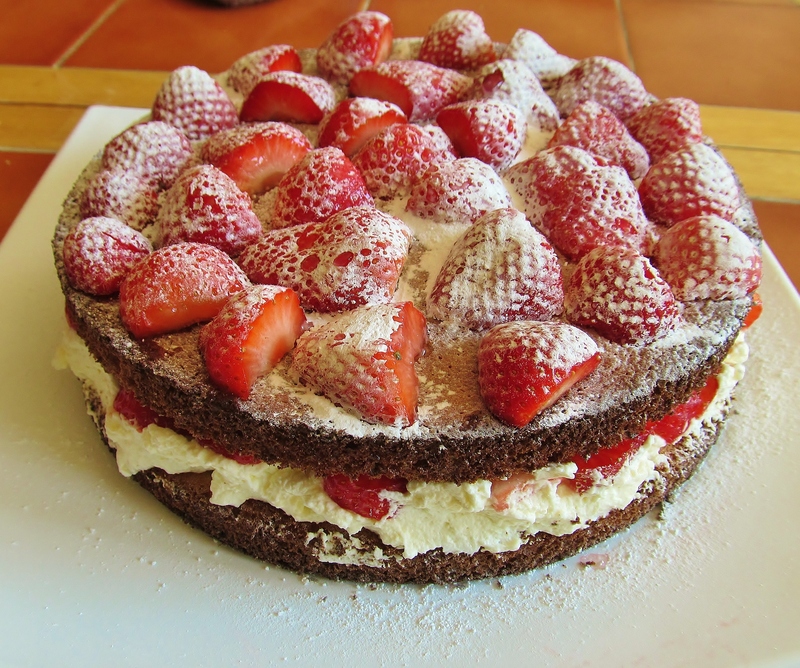 I decorate the top with half strawberry pieces and dusted it with icing sugar. It was rather tasty and my niece liked it so much she had 2 pieces! 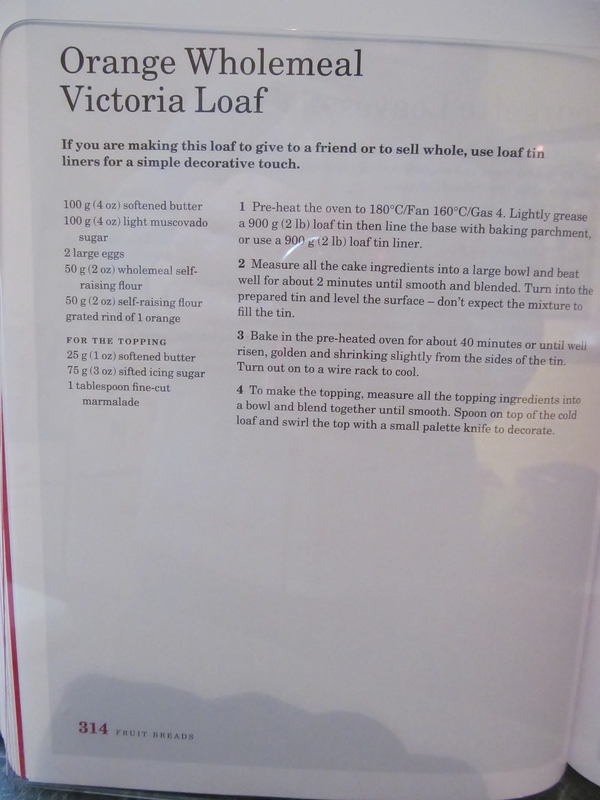 The only thing I would say is that I would probably use a Victoria sponge recipe to make the sponge next time. 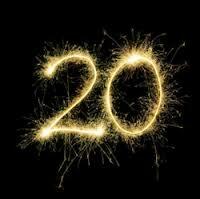 I would like to dedicate this blog to my niece Emily in celebration of her 16th birthday, with love x. 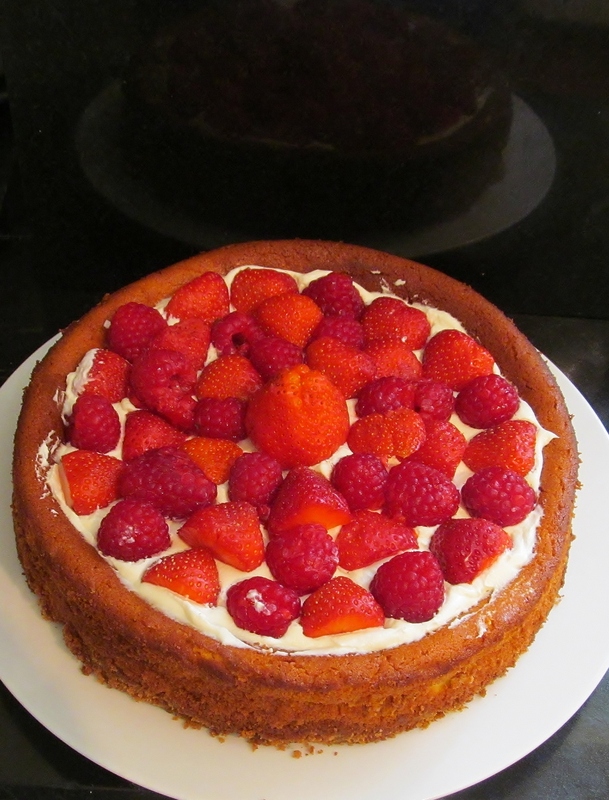 Week ten, so what to choose to bake this week? 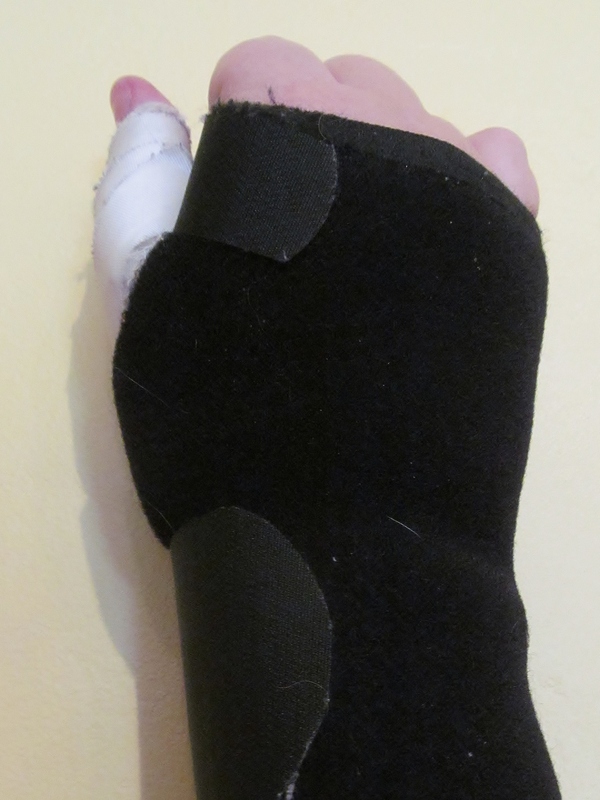 Well, I know one of my previous posts told the tale of the scalded hand……well this week has been influenced by the fact that I have strained the collateral ligaments in my thumb. It doesn’t sound much but I couldn’t even take the plastic screw lid off the milk without excruciating pain so I took myself to get it looked at and it needed to be strapped and I have to take regular ibuprofen and try not to use it. SO with this in mind, I sat with a cup of tea and Mary Berry’s Bible and looked through to see what I could make where my mixer could do all the work and this is what I came up with. The only bit I needed help with was grating an orange for the rind and that’s where my angel of a hubby came to the rescue – what a star! So, I (carefully) weighed everything out, stuck it under the mixer and hey presto – one mix with no fuss. I put it into the tin, Mary does say it doesn’t look like it will fill the tin and she was right! Timer on , 40 minutes later, this is what came out. I must say, it rose beautifully, was a great golden colour and the aroma wafting upwards was lovely. 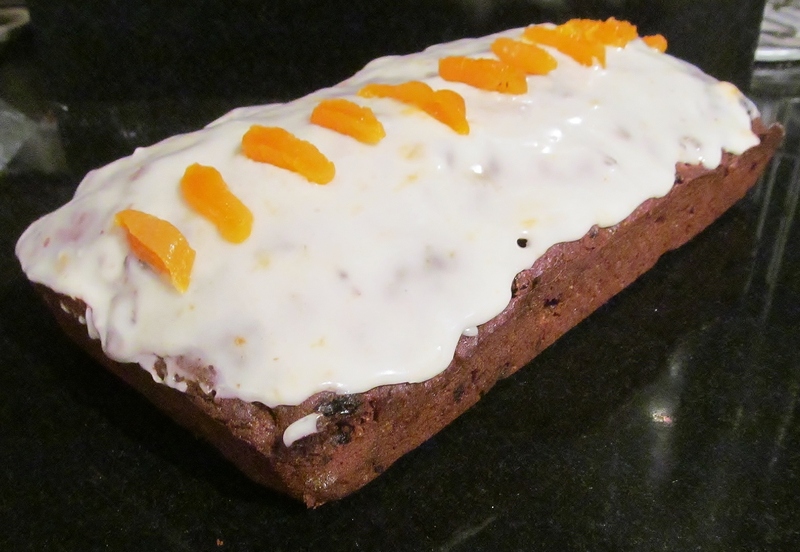 It needed a topping when it was cool, of softened butter, icing sugar and marmalade. I think even Paddington Bear would approve of this recipe! 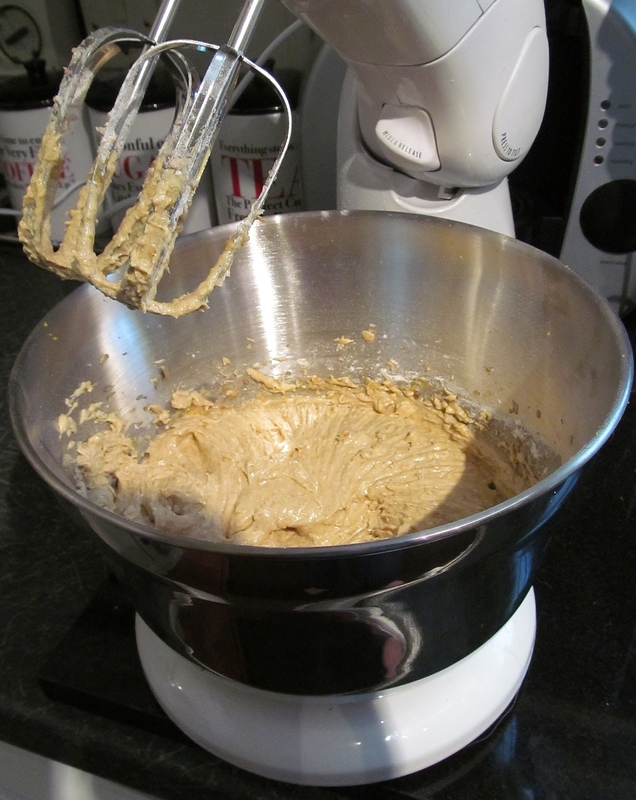 I am going to start looking now at other recipes i can use the mixer to do all the work as I get the feeling my hand will need to heal for a while yet……..sigh.